Luxury second floor condo with one of the best locations on the Windsor Hills resort - directly overlooking the lake, but just steps from the pool gate and clubhouse - the best of both worlds. It is peaceful and quiet, not overlooked, but close to all the amenities on offer at Windsor Hills. The condo has top of the range interior and furnishings - it has just been refreshed and redecorated with new mattresses, new living room furniture and new carpets. The large living/dining area has a screened balcony with view of the lake. 3 large bedrooms offer plenty of space to relax - a king bed, a queen bed and 2 twin beds. There are HD Plasma televisions in all rooms and a PS2 in the third room. 2 full bathrooms, a fully equipped kitchen with Nespresso coffee machine (just bring your own pods) and laundry room with washer and dryer and all linens and towels included. Rental includes free WiFi and long distance calls. We also have a pack and play (travel cot), highchair and stroller for infants. Facilities at Windsor Hills are second to none, it is one of the top rated resorts in Orlando. Luxurious pool with water slide, lagoon spa, tennis courts, cinema, clubhouse fitness center, putting green and more set in green, lush and beautifully landscaped grounds - use of all facilities is included in the rental, there is are no additional resort fees to pay on site. All this and you are just 5 minutes from the Disney gates - the closest you can get without staying on Disney property - ideal if you want afternoon breaks from the parks. All other Orlando attractions are an easy drive from the resort and there is a superb golf course next door. Windsor Hills resort is one of the best in Orlando - pool, clubhouse, movie theater and sports facilities all free of charge for residents. Overlooking the lake - beautiful and peaceful location, balcony is perfect for watching the sun rise and set over the lake. Windsor Hills is a Five- Star, twenty-four hours gated, secure resort located 1.5 mile from Disney and with easy access to other majors parks. Our condo is located on the second floor, overlooking the lake, and a 30 second walk to the pool and the clubhouse. As Windsor Hills guest you will be able to enjoy free, unlimited use of all the amenities, including taking a dip in the lagoon style swimming pool, comfortably heated, or relax in the spa or the sundeck, while the kids have fun going down the two-story water slide at the pool.In your condo are 4 Plasma, High Definition TVs w/ DVD, PlayStation 2 w/ dual controllers. Free Booster Seat, Crib and High chair for our littlest guests. Also provided is free unlimited broadband, wireless Internet access for your personal laptop, and free nationwide and local telephone calls. Enjoy watching a magnificent sun set from your balcony. Please note: Laundry soap, detergent,toilet paper, paper towels, beach towels, shampoo,soap are not included. 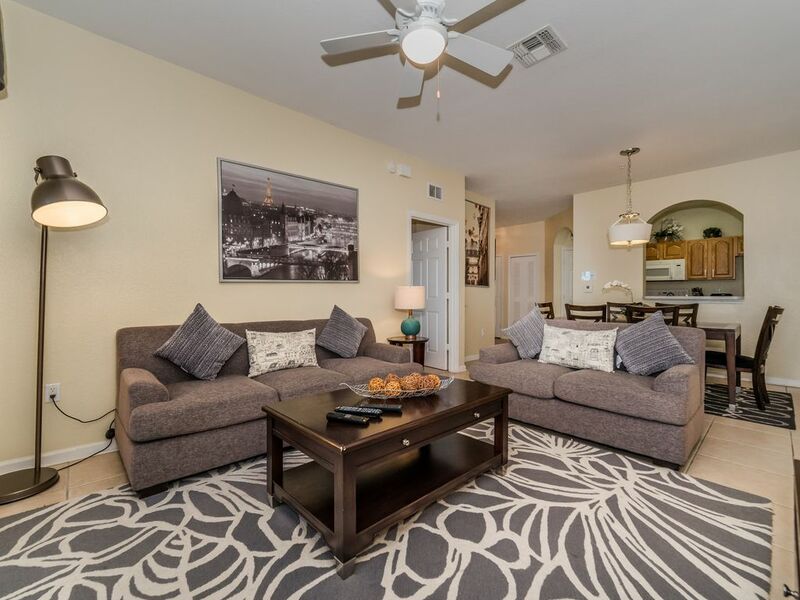 Great condo in a great location close to Disney. Grandkids loved the pool, spacious unit. Joy answered every question we had and check-in was a breeze. Our family would definitely stay with Windsor Hills again! Overall, the property was fine. It felt a little old and used. The carpets were grungy looking and the bathrooms were clean but very used looking. The bedding seemed old and the bath towels were thin and scratchy. Not bad for the price. I feel with a little updating, it would be a wonderful place to stay. Spacious, clean, close to WDW, amazing pool! This condo was perfect for two small families. The kids enjoyed having their own room and it was very spacious. Super clean and well-appointed. The owner, Joy, was incredibly helpful and genuinely wanted to make sure that we enjoyed our weekend. The location is super close to WDW and the pool and slides are amazing! We will definitely recommend Joy’s condo to others and return the next time we are in Florida. Thanks again, Joy! Thank you so much for your review Elizabeth. We really do appreciate it when guests take the time to give feedback. We are so pleased that you enjoyed the condo and the facilities at Windsor Hills as much as we do. Thank you again for choosing our condo, hopefully our paths will cross again some time in the future - you know where we are! Condo just as the pictures show - lovely décor with everything you could ever need. Superb location - close to pool and clubhouse but with the most stunning view over the lake - a real highlight for us. The owner was exceptionally helpful as well, communication was so easy and she couldn't do enough for us. Stayed in a few condos at Windsor Hills and other resorts in the past - this was by far our favourite. Thank you so much - so glad you enjoyed staying in our condo, we love the view as well! Thank you also for taking the time to write a review. HIGHLY RECOMMENDED, The Condo is in a great position for all the Disney Parks, Universal is only an easy drive away. The Condo is extremely well appointed, and has a very 'homely feel' Windsor Hills is great resort. My family and I have been going to Orlando since 1999, in this Condo, and it's owners we have found hidden jets. The Condo is very spacious, has everything you could ever need. The Owner Joy is extremely helpful, emails are answered very promptly, and Joy is happy to help in anyway possible to make your stay special, she offered lots of helpful advice. I will happily recommend, both the Condo and Joy, and look forward to future stays, thank you Joy & Paul. My family stayed at this condo in April when we took our kids on vacation for their birthdays! It was a great place to stay! Resort is wonderful! Loved the pool area! We also ventured out and found the playground which the kids also loved. I just can't see paying $$$ to stay at a Disney resort in a hotel sized room when I can stay here for a fraction of the cost and have 3 private bedrooms, 2 bathrooms and a full kitchen. We had a total of 5 kids with us ranging in age from 1 to 11 and this condo was very kid friendly. Resort is very close to Disney parks with minimal traffic. It is also close to a Publix and Target, which are two of my favorites. Publix for groceries during our stay and Target for souvenirs (much cheaper than buying them at a Disney park). We will certainly plan to stay again! Kennedy Space Center- 60 minutes. Beaches (West Coast and East coast)- 50 miles. Driving direction to the condo: When traveling West on I 4, take Exit 64 (And not 64B as mentioned by the GPS) toward Magic Kingdom, Hollywood Studios, and Rte 192 W. Then stay in the left lane until turning left at the 3rd set of signals on Old Lake Wilson Rd ( Rte 545). Then turn right on Teascone Blvd, at Windsor Hills Resort, about 3/4 mile from the light. Premium rates apply for Christmas and other peak times, also at Christmas and other peak times there is a minimum stay of 3 nights.